This absolutely beautiful Grow a Garden Felt Veggie Kit is handmade with 100% pure wool felt and comes with everything needed to encourage a love of gardening and imagination in your child. This lovely toy includes a whopping 36 individual wool felt vegetables that can be planted into the also included, felt garden bed box. Your child can then harvest her veggies, use them to whip up veggie meals in her play kitchen and then re-plant them so that the fun starts all over again. 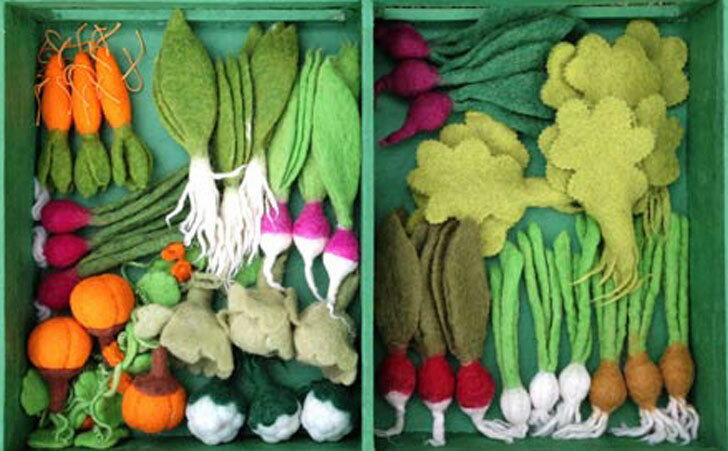 The wool felt planting box also serves as storage for all the veggies when this toy is not in use. The veggies included are 3 white radishes, 3 turnips, 3 red radishes, 3 red onions, 3 pumpkins, 3 lettuces, 3 garlic, 3 carrots, 3 cauliflower, 3 beetroot, 3 brown onions and 3 cabbages. Each piece of felt food is designed and made locally in Nepal and contains zero synthetic fillings. This absolutely beautiful Grow a Garden Felt Veggie Kit is handmade with 100% pure wool felt and comes with everything needed to encourage a love of gardening and imagination in your child. This lovely toy includes a whopping 36 individual wool felt vegetables that can be planted into the also included, felt garden bed box. Your child can then harvest her veggies, use them to whip up veggie meals in her play kitchen and then re-plant them so that the fun starts all over again. The wool felt planting box also serves as storage for all the veggies when this toy is not in use. The veggies included are 3 white radishes, 3 turnips, 3 red radishes, 3 red onions, 3 pumpkins, 3 lettuces, 3 garlic, 3 carrots, 3 cauliflower, 3 beetroot, 3 brown onions and�3 cabbages.�Each piece of felt food is designed and made locally in Nepal and contains zero�synthetic fillings.